It may only take up a third of his garage, but Tony’s tiny art studio has birthed an inordinate assortment of wild ideas. The garage door is open as I park outside of Tony Baumann’s house on a hot July afternoon, but there’s no sign of the man himself. 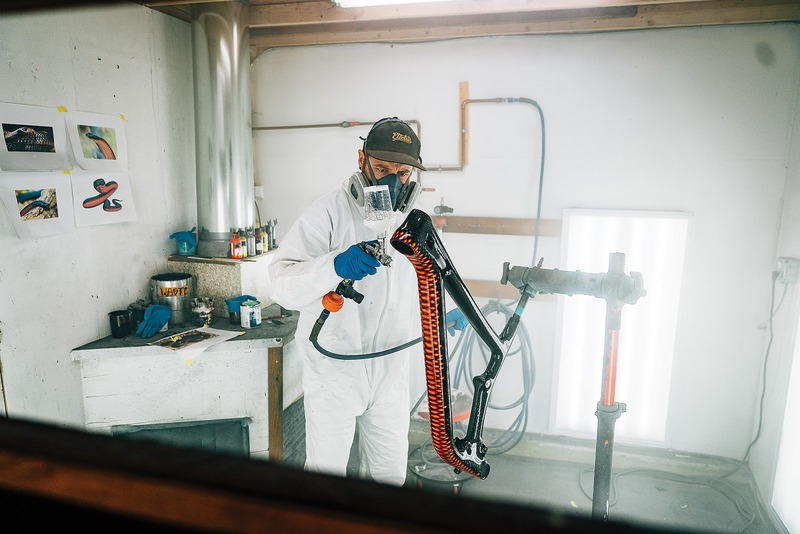 I duck under the door, following voices into the small, hand-built painting studio that occupies a third of the garage, where I find him chatting with professional mountain biker and Bellingham resident Bryn Atkinson. Between them is a red-bellied black snake, a species native to Bryn’s home of eastern Australia. This one, however, isn’t venomous, nor is it alive. 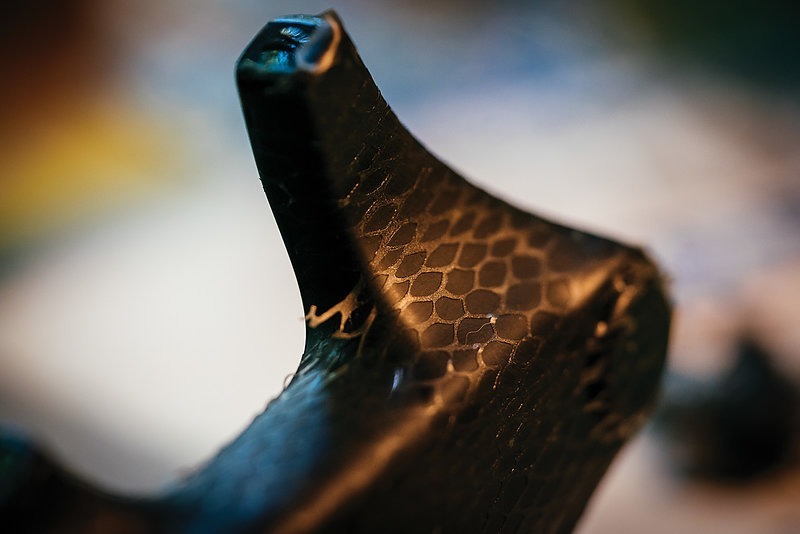 The smooth curves belong to Bryn’s Norco Range, the carbon weave hidden under freshly painted silver and black scales. The underside of the bottom tube is bright red, matching perfectly with photos of the snake pinned to the wall. It’s the culmination of a months-long collaboration between the two Bellingham transplants, and it’s stunning. And a little bit creepy. The men are both experts in their field; Bryn is a top-level athlete with a successful UCI World Cup career, who now produces all sorts of mountain bike media projects. Tony is a professional artist who specializes in custom-painted bikes and helmets. Together, they envisioned one unique bike—two buds, with the means to make it possible. 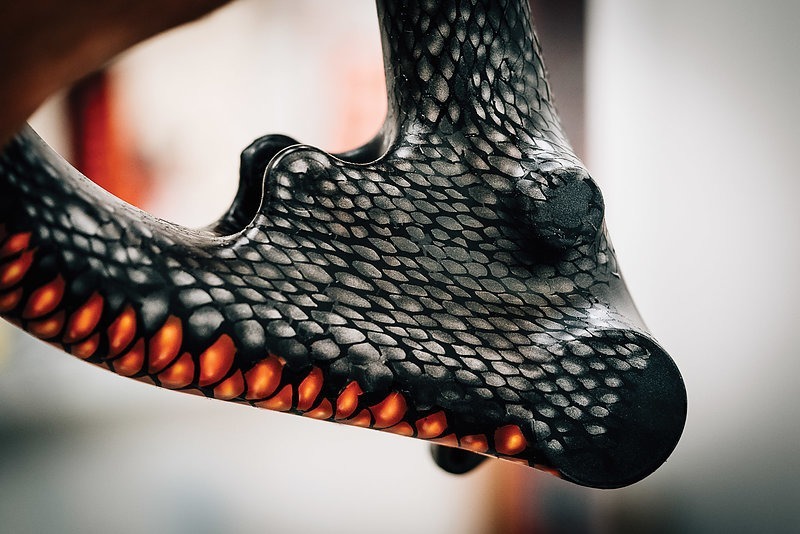 Creating custom graphics for a bike frame is an extensive process, one that requires sanding off the original paint and covering the entire thing—weird curves and all—in a vinyl mask of scales. It took years for Bryn Atkinson’s “Snake Bike” to go from concept to completion, but it was worth the 80 hours Tony spent on the project. 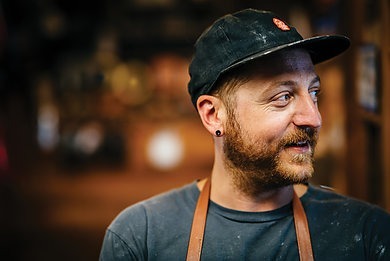 While Tony now operates his company, Made Rad, out of his garage workshop, his path into the bike industry began with a job instructing retail development classes for Specialized Bicycles. By day he’d work in the office; by night he’d experiment in his backyard, spending hours painting various bike paraphernalia like helmets and frames. Eventually he took on projects for friends, and from there his artis- tic reputation grew. Specialized even designated him as one of the few people who could paint their carbon bikes and helmets without voiding warranty. 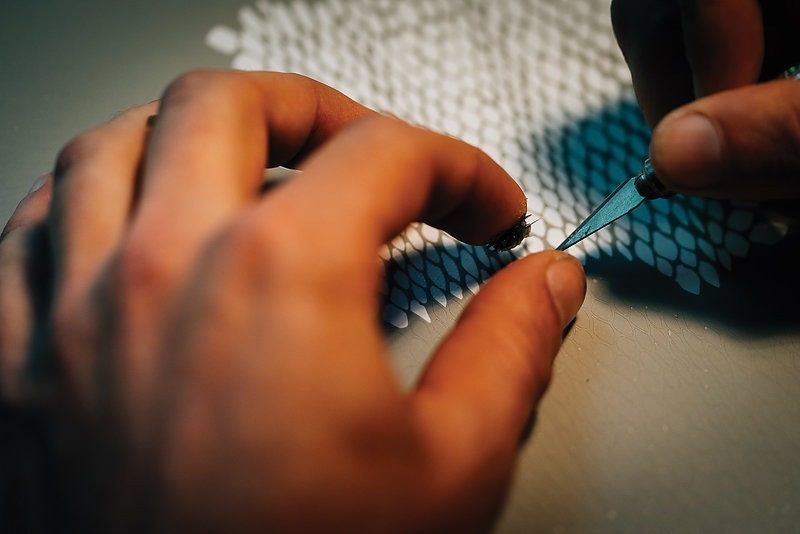 His first big break came when he painted a downhill bike for Ken Block, cofounder of DC Shoes and professional rally car driver of YouTube fame, who posted an image of the bike for his 4.1 million Instagram followers to gawk at. From there, it was bikes for American triathlete and Olympic medalist Gwen Jorgensen, UCI World Cup racer Troy Brosnan, and a slew of other professional athletes. As Tony’s backyard experiments began to build momentum, he decided to take the leap and become a full-time painter. In 2015, on his 30th birthday, Tony and his now-fiancé moved to Bellingham, where they fit perfectly into the town’s fervent bike culture. Now, he’s got projects lined up months in advance. It was in Bellingham that Tony met Bryn, and scheming for a custom bike began almost immediately. Bryn explained his vision to Tony, and from there they delved into designing the “Snake Bike” (as the two have been referring to it throughout the process). Each brought something to the table: Bryn, the concept; Tony, the means to make it a reality. 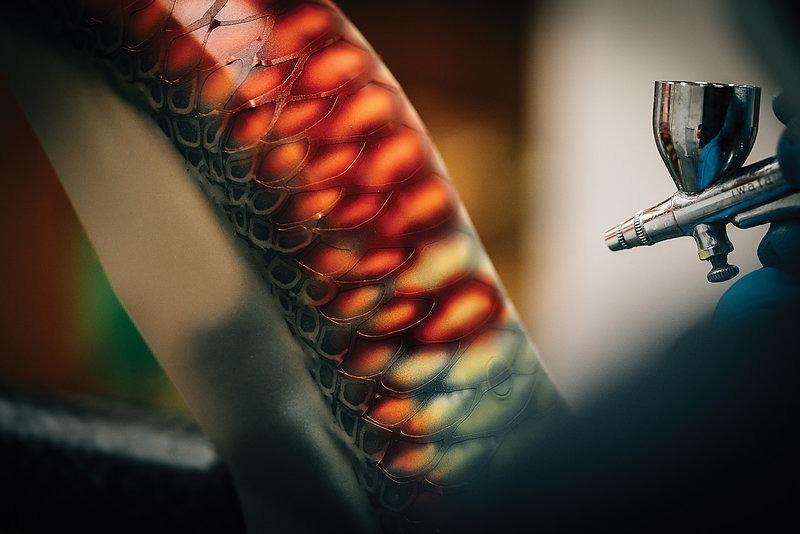 The 80-plus hours that went into Bryn’s bike is nearly double what it takes Tony for others, but the result is beautiful, intricately detailed and exactly what both imagined it could be. W ith multiple rounds of paint and vinyl masking complete, a final clearcoat brings the “Snake Bike” to life. Bryn would stop by every few days to provide feedback, insight and, at times, moral support when the intricately mundane task of cutting vinyl was overwhelming. Tony pulled a few 14-hour days to meet the project’s tight turnaround, and estimates he spent a total of nearly 80 hours on it—at least double what he spends on most other bikes. As Tony takes the bike off the stand, out of the spray room and hands it to Bryn, the excitement is palpable. 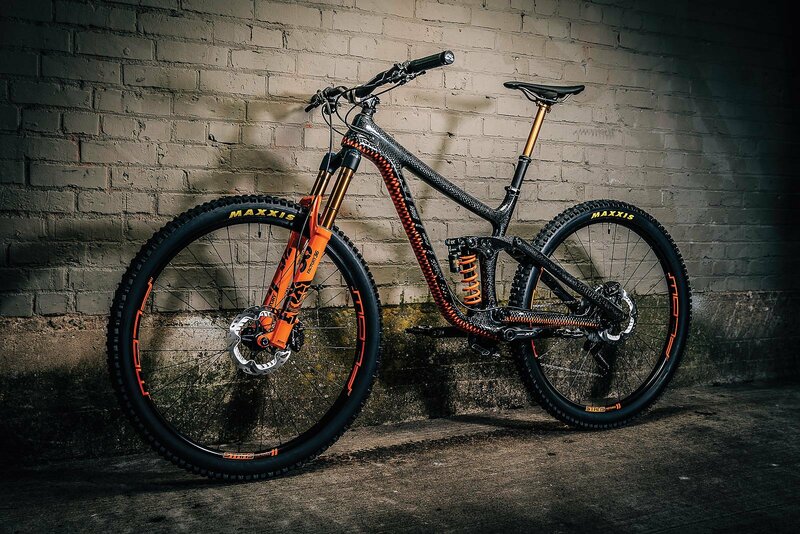 All the hard work that has gone into this stunning, one-of-a-kind bike overshadows any feelings of enervation. 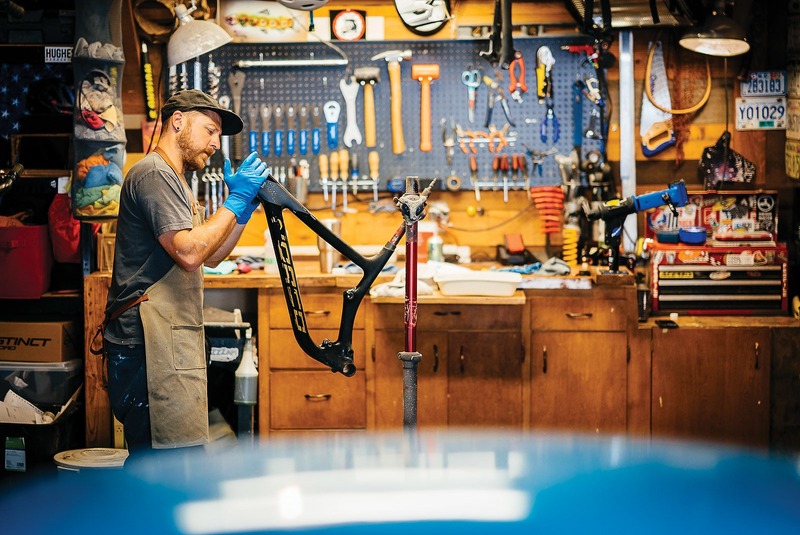 He’s exhausted but Bryn’s stoke is giving him a second wind, as he doesn’t often get the opportunity to hand a finalized frame to a customer— or, more importantly in this case, a friend.